Port Clyde is located on the lower St. George Peninsula near the mouth of the St. George River. 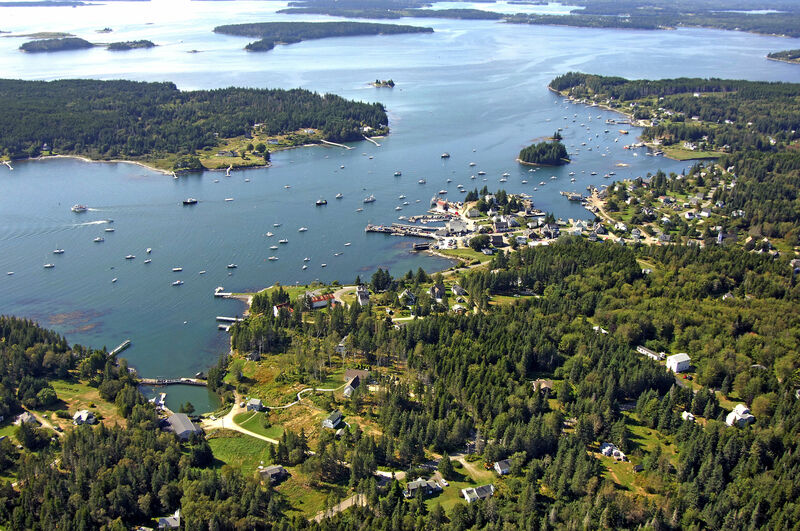 Port Clyde is 13 miles northeast of Pemaquid Point and 22 miles southwest of Vinalhaven Island. The image above is a view from the south looking north over Port Clyde Harbor where it meets the St. George River. 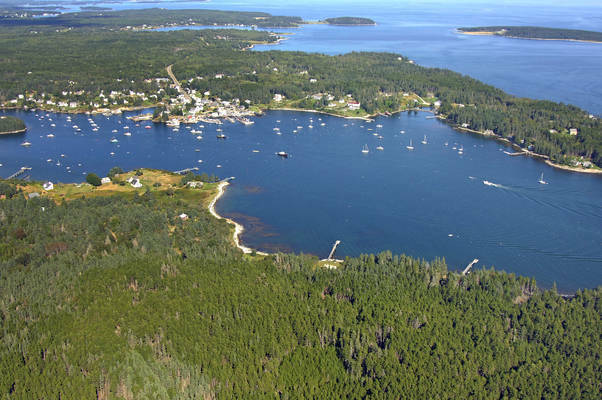 The large forested area off to he left (west) is Hupper Island, while to the right is the town waterfront of Port Clyde. 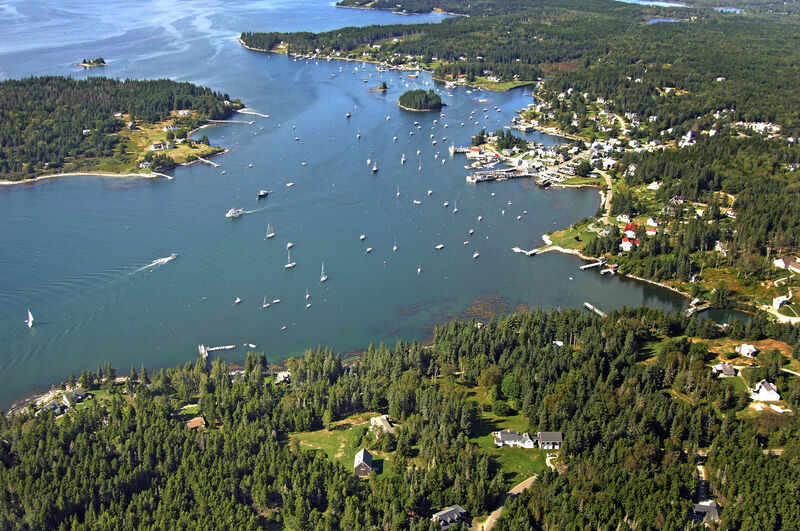 There are two marinas in Port Clyde, but neither have dock facilities for transient guests. 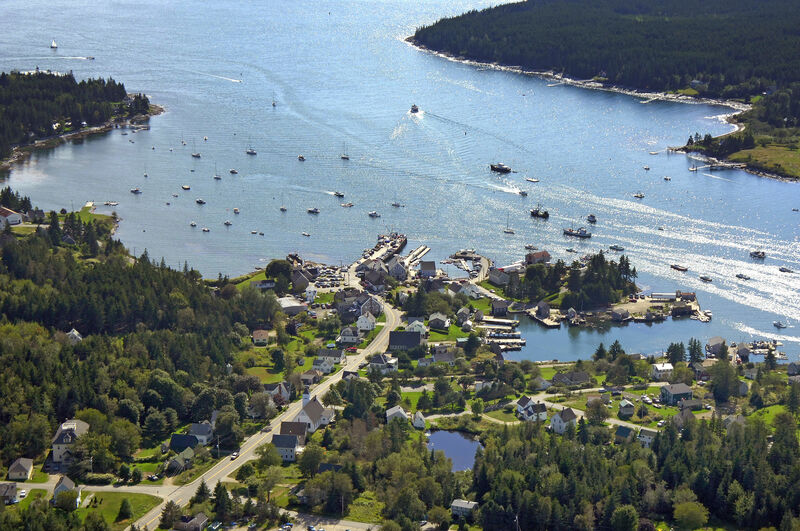 The Port Clyde General Store administers the moorings in the harbor and there are sporadic areas to anchor. Keep in mind that ferry boats leave daily from here to Monhegan Island, so a clear channel must be maintained. Primarily a shipbuilding and fishing village as far back as the 1800s, Port Clyde supported a large sardine fishing and canning economy until the turn of the century. Today, Port Clyde is a typical working harbor with lobsterman and fisherman departing and arriving in the harbor at all hours of the day to tend their pots and nets. Although there are technically two entrances to Port Clyde, the southern approach (Atlantic Ocean side) is the deepest and most well-marked. 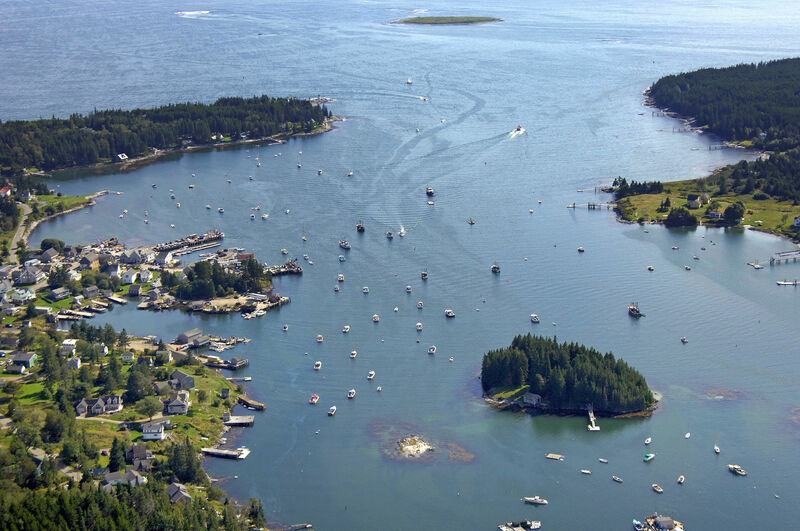 Some boats use the approach channel on the north side of Hupper Island, but unfortunately, it is not marked and there is an area of uncertain four- to five-foot depths just east of the Port Clyde waterfront. If you decide to use this entrance, do so only if you draw three feet or less and only with reliable, precise local knowledge. Playing it safe requires using the southern entrance, and thats what we recommend. From the St. George River, first set a course for flashing green bell buoy 11, which marks Gig Ledge and is located at an approximate waypoint of N43 53.865 W69 17.663. Once you have safely navigated to flashing green bell buoy 11, set a new course of about 066 degrees magnetic for around .7 mile to pick up green can buoy 9, which marks the location of The Sisters, a large rock outcropping youll want to avoid. From this area, if arriving at night or in fog, you should be able to sight or here the Marshall Point Lighthouse, which is 30 feet above the water and flashes a white light with horn during fog. Clear of green can buoy 9, set a course of about 045 degrees magnetic for approximately a half-mile to reach red nun buoy 8. Leave red nun buoy 8 decidedly to port; there is a steep shoal just to the north of it. Another half mile to the northeast is green can 7, which marks the location of the northern ledge off Hart Island. Next in line is red nun buoy 2 off Marshall Point, and then green can buoy 3 in toward the Port Clyde waterfront. An alternate southern approach is between Hart Island Island and Gunning Rocks. If you can navigate your way between the two you can head north to intercept red nun buoy 6, and then pick up the regular route into the harbor at red nun buoy 2, making sure to give Marshall Point plenty of room. See the Helpful Links section at the bottom of this page for detailed information. Bicycle or foot travels are the best modes of transportation in this remote locale. Knox County Regional is the closest airport to Port Clyde, some 13 miles to the northeast. Taxi and limo service can be arranged through the airport. No reviews yet! 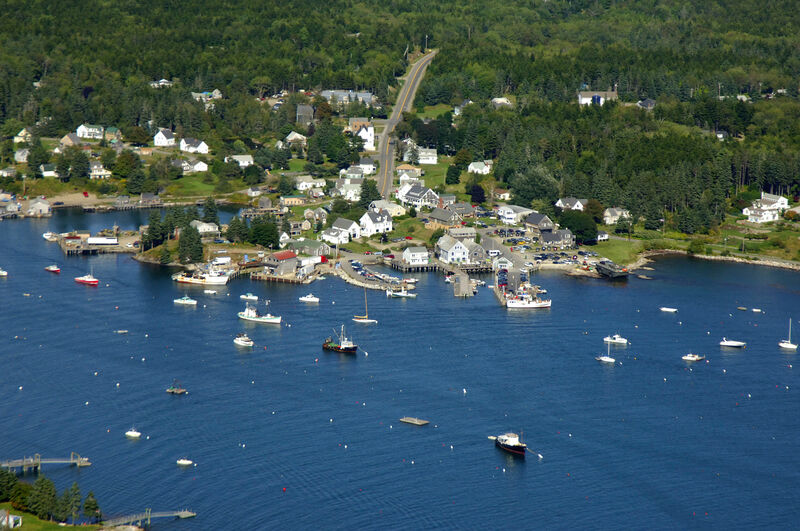 Be the first to write a review of Port Clyde.